Chutneys originated in India, and oddly, the original word: chatni, means a mix of spicy ingredients combined freshly to accompany a curry, not a preserved dish at all! Another oddity of modern chutneys is that the original chatni was highly seasonal, with different versions being made as different ingredients were available through the year, but today we eat chutneys - like the classic mango chutney - that have invariable ingredients and always taste the same. Modern chutneys either fruit or vegetable based, or made from a blend of the two. The ingredients are chopped before cooking with spices and vinegar to give flavour and preservation. The usual texture is quite smooth with a thick liquid component although some chutneys are quite chunky and others are totally smooth. Well-made chutneys improve with age, through the maturation process, and when made and stored properly they keep their condition for several years. In Europe, the classic base ingredients are windfall apples and red or green tomatoes, although you can also use autumnal fruit such as rhubarb and pears and glut crops like courgette, marrow and even green beans. It is common to use dried fruit like raisins, sultanas and currants to add sweetness and body to the chutney, but you can equally use prunes, apricots or even dried mango or apples. Vinegar is a vital part of successful chutney-making because it allows the preservation of the condiment. Chutney doesn’t ‘set’ like a jam or jelly, so you need your vinegar to preserve the ingredients and stop them going bad – a vinegar of at least 5% acetic content is essential, and while you can use malt, white or wine vinegars, try to use paler and lighter flavoured ones with subtle base fruits and vegetables and malt vinegars for more robust ingredients such as tomatoes. Sugar is also essential and if you like a dark chutney, choosing a brown sugar adds to the colour of the final preserve. A couple of teaspoons of black treacle in a strongly-flavoured chutney can add a depth of flavour as well as a deeper hue to the finished preserve. Spices are what makes a chutney tasty and it’s generally preferable to use whole spices as ground ones can make a chutney look murky. Traditionally the spices are bound up in a scrap of muslin and cooked with the other ingredients before being fished out when the chutney is put into jars. You will need a glass, stainless steel or enamel-lined pan big enough to hold all the ingredients. Don’t use brass, iron or copper saucepans as they undergo a chemical reaction with the vinegar which makes the chutney taste bitter and metallic. A heatproof jug or jam funnel will make it easier to get the hot chutney into your sterilised jars and some scraps of muslin or cotton in which you can tie up your spices can be useful. Buy a long-handled wooden spoon and keep it just for chutneys and other savoury preserves: the spoon soon becomes impregnated with the taste of the spices. You need heat-proof jars that have been sterilised by placing in a cool oven for five minutes, and the jars have to be covered with plastic not metal lids, as the vinegar will eat through metal. This classic British chutney is good with cold meats or cheese. 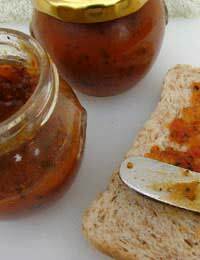 If you like a more robust chutney, swap the light sugar for dark and the cider vinegar for malt. Simply put all the ingredients in a suitable saucepan, stirring to combine. Bring to a boil over a low to medium heat. Once the chutney has reached boiling point, simmer it, uncovered and stirring frequently, for around forty minutes until it becomes thick and dark. Take from the heat, cool a little before removing the ginger and then pouring or spooning the chutney into sterilised, jars. Seal jars and when they are fully cold, label them. Leave for six months before eating. I allowed my chutney to go cold before I put it in jars....will it compromise the taste or how long it will last?